Tuesday dawned not too windy and amazingly dry. So I made a late start to Laxative armed with some maggots and a plan. Having watched a bloke bagging livebait sized silver fish on the Friday I was sure that my livebait snatching rig would soon have a couple lined up to use as bait. With this plan in mind I had packed a rod set up with a drifter. Although I arrived after daybreak I was confident, and a lamprey head went out on a leger and a smelt on the sunk float paternoster, then the feeder was flung. On the second cast the feeder produced a fish. The smallest Tommy ruffe I have ever seen. Aren't they slimy? Yack. I was sheltered from the full force of the wind, but it was creating quite a tow on the lake, pulling the line out of the clip on the leger rod. Around ten o'clock the line pulled out again, and as I tried to put it back in the clip it was snatched from my fingers! 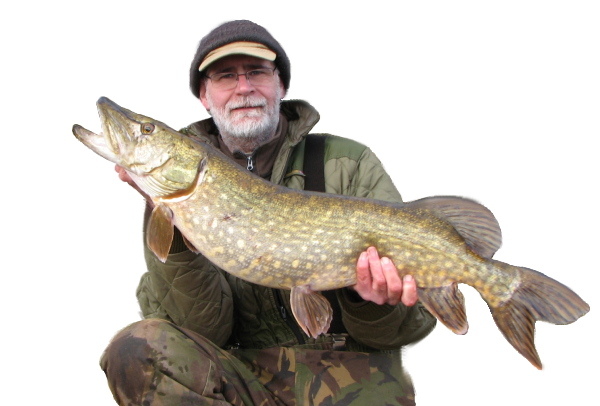 I was soon landing another fat pike watched by a pleasure angler who had turned up and urged me to 'Knock it on the head!' He was only jesting and told me the fish was a regular visitor to the bank. The weight he put on it was a little optimistic - but not by much. Eventually I managed to catch a bait sized roach which promptly replaced the smelt. Not quite so promptly it was taken by a fat little jack. The rain arrived next, encouraging an early finish to the session at noon. The intention being to get the barbel gear sorted for today. As you might guess, that plan changed when I was kept awake last night be the howling of the wind. It's been a stormy Wednesday all right.